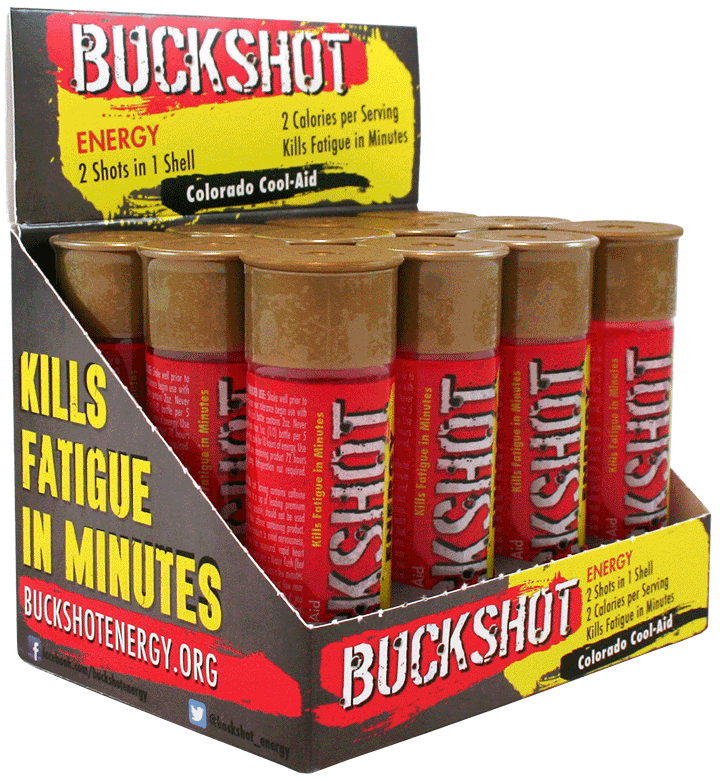 Buckshot’s 10 Gauge/10 Hour Energy Shot is a concentrated liquid energy blend, packaged and sold in a convenient 2 oz. bottle. While Buckshot’s trademarked shotgun shell packaging grabs your attention, the great tropical punch flavor keeps you coming back for more! Each bottle contains two 1 oz. serving shots. Buckshot energy is a better value since you get 2 full shots in one shell. It has a great tropical fruit punch taste, and provides maximum energy without the crash. It also has B-Complex vitamins that support focus and motor functions while reducing stress. Each 1oz. serving contains as much caffeine as a cup of premium coffee, plus enough B-vitamins, amino acids and nutrients for five hours of energy!